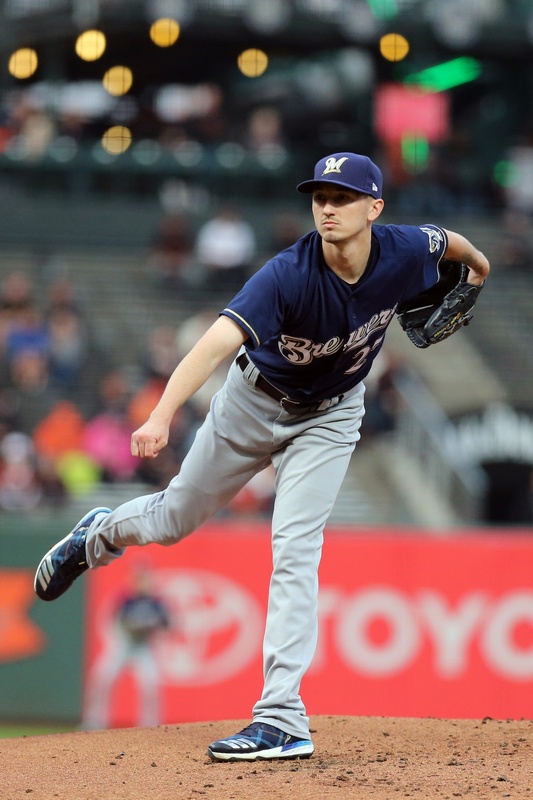 Entering 2017, the Milwaukee Brewers employed a rotational turn consisting of five righties: Junior Guerra, Zach Davies, Wily Peralta, Chase Anderson, and Jimmy Nelson. Coupled with Matt Garza on the disabled list, this major group was 20 runs below average over 845.3 innings in 2016. The sole positive producers were Guerra and Davies, the former serving as a stunning, storybook age-31 rookie, the latter serving as a steady, age-24 rookie. Guerra and Davies prevented 26 runs on their own; the remaining quartet wavered between slightly worse than average (Anderson and Peralta) and nearing-replacement-level (Nelson and Garza). Yet, #InStearnsWeTrust / #SlinginStearns opted to return this entire rotation to the club in 2017, opting neither to make a major trade (or even a minor one) to improve the rotation. Of course, Stearns was juuust a bit ahead of fans (including myself) as pitching coach Derek Johnson (and presumably the club’s analysts) were working through mechanical and arsenal shifts with both Anderson and Nelson, and the young-and-steady Davies was not going anywhere, either. These six starting pitchers, justifiably described as bad or less-than-ideal (if you’re feeling kind) in 2016, worked 750.3 innings while preventing nine runs in 2017. The club definitely suffered from Guerra’s opening day calf injury (and then his lack of command), while Peralta showed that he could not build on any gains made during the previous season. But Davies was no joke, improving on his 45 Overall Future Potential (OFP) role to the extent that one might at the very least discuss enshrining him as the ideal back-end starter (at best, he’s surpassed that role). Anderson and Nelson both proved to be the real deal at least for one season, leading the 2017 rotation to an even greater extent than Guerra and Davies lead the 2016 group. C. Anderson 141.3 26 ? J. Nelson 175.3 16 ? Z. Davies 191.3 9 ? B. Suter 81.7 9 ? J. Chacin 180.3 6 ? B. Woodruff 43.0 -1 ? J. Guerra 70.3 -8 ? Everyone knew the 2017 returning rotation was going to be dreadful, until it wasn’t. So here we stand, with almost everyone (including myself) assuming that David Stearns will make another pitching move entering 2018. What’s strange, however, is that for all the #InStearnsWeTrust that Brewers fans fly, they still largely refuse to learn or analyze the GM’s inner workings, such as his 2016-2017 lack of rotational moves and the resounding success that followed. It remains worth repeating that pitching is the strength of this Brewers club, which is why Stearns spent significant monetary and prospect resources (justifiably) improving the outfield and, by extension, batting order for 2018. Stearns did not necessarily need to improve the starting pitching rotation in 2018, unless one rambles off a set of beliefs: Anderson isn’t who he was, Davies isn’t who he was, Nelson is injured, Garza and Peralta are gone, and Junior Guerra cannot be relied upon. Okay, so Stearns signed the inimitable Jhoulys Chacin, who looks like a rich man’s Junior Guerra (seriously, look at his arsenal and tell me that’s not Guerra’s ideal form), and brought back Franchise Pitcher Yovani Gallardo for what could be another spin at the rotation in Milwaukee. Meanwhile, the rotation is filled with enough “You’ve got to be kidding me” to give the excellent 2017 staff a run for its money. Homegrown arms take the shape of Brandon Woodruff and Brent Suter; deeper into the system, there are advanced prospects like Jorge Lopez and Freddy Peralta (on the 40-man roster) and Corbin Burnes (off the 40-man roster). If you squint, there’s at least two #3 starters among that trio, maybe as soon as 2018 to boot. If you’re a glass-half-empty kind of fan, that’s a whole bunch of low rotation and reliever risk. But this is not a problem, either, and I direct you to the 2013 rotation as evidence. Although, perhaps that 2013 rotation is a precisely perfect corollary to the 2018 rotation, as then GM Doug Melvin punted on replacing Zack Grinke or Shaun Marcum and only really received a rotational upgrade after Mark Attanasio negotiated with Scott Boras deep into Spring Training. Still, having lived through that rotation, I’m not convinced that Alfredo Figaro (74.0 IP / -6 runs prevented), Hiram Burgos (29.3 / -9), Mike Fiers (22.3 / -10), Johnny Hellweg (30.7 / -16), and Wily Peralta (183.3 / -21) are quite the same as Guerra, Woodruff, Suter, Gallardo, and Lopez. Even if you’re the glass-half-empty type here, that low-rotation floor should be substantially higher for Woodruff and even Suter than it ever was for Johnny Hellweg or even Peralta (although that’s probably rewriting history with hindsight). In fact, looking at this story again makes it seem inevitable that Jake Arrieta will be wearing Brewers blue on March 26. Stearns works with starting pitchers who do not throw with elite (or even median!) velocity. Stearns largely continues the Doug Melvin trend of working with over-the-top deliveries (Anderson is probably his best example here, and Suter was an anomaly be it with Melvin or Stearns). Stearns loves starting pitchers who have some type of wiggling fastball (be it a sinker or cutter) and a change-up / curveball profile. Obviously, you can’t check all three boxes with all pitchers (e.g., Chacin and Woodruff both approach that ideal workhorse body while working as primarily fastball / slider types, and Woodruff’s primary fastball velocity was in the Top 15 percent of all 2017 starting pitchers who threw at least 50 pitches). But there’s enough of a trend across these arms that one can begin to assess what Stearns is looking for in a rotation, and there’s enough success (even if it was somewhat surprising success) in 2017 to begin to take seriously the idea of “trusting” in Stearns’s rotational ideals. So here we are: why trust the rotation? Baseball Prospectus recently released three new pitching statistics that approximate a pitcher’s Power, Command, and Stamina. Of the 608 pitchers that threw at least 10 innings in 2017, Brandon Woodruff is one of only 51 to score a “50” (or better) in all three categories. This list is dominated by two types of players: young pitchers or injured pitchers who posted mediocre (or worse) DRA during their 2017 campaigns, veteran starters generally regarded as solid-to-top rotation types (see Jacob deGrom and Justin Verlander or Gerrit Cole, Lance Lynn, or Jeff Samardzija), or elite relievers (Woodruff’s teammates Corey Knebel and Jacob Barnes are also on this rare list). Woodruff probably is not slated to become Verlander or deGrom or Cole, but even if he reaches Michael Wacha’s range of production, the club is in fantastic middle rotation shape. Zach Davies and Brent Suter are both command “aces” (for lack of a better term), overcoming their velocity shortcomings by hammering the strike zone in quality locations (the Command statistic actually tracks certain pitching zones deemed ideal for working corner / borderline strikes). Yovani Gallardo and Chase Anderson are near clones of one another (one might ask whether the Brewers are still using biomechanical data that drew the club toward the high release point years ago!). While neither pitcher is graded as a strong “Power” arm, both make up for their lack of power pitching with better than average command and stamina grades. Jhoulys Chacin and Junior Guerra both grade as mediocre Power and Command pitchers, but Chacin makes up for these grades with his Stamina. On the other hand, Jimmy Nelson probably grades as the club’s truest “Power” starter, as the righty does not grade well in Command but makes up for that shortcoming with Power and Stamina. Across the rotation, Nelson, Davies, and Chacin grade as groundball pitchers (each with a rate at or slightly better than 50 percent in 2017), while Suter, Anderson, and Gallardo grade as steady or improving groundball workers (this trio sits below 50 percent grounders, but one might question whether Suter and Anderson can flirt with that mark given their improvements). Finally, as I examined with the club’s approach to the elite Chicago Cubs offense, the Brewers starting pitchers attack the strike zone. Compared to the 2017 National League, the Brewers starters walked notablty fewer batters (23 fewer batters than expected, a 7 percent improvement versus the league). What is particularly interesting here is that the pitchers as a group do not grab an 0-1 count more frequently than the National League average, which suggests that the Brewers win their command battle by yielding weak first swings (95 split OPS+), and winning 2-0, 3-0, 1-1, and 2-1 counts. The Brewers are entering one of the most important seasons in franchise history with a “What on earth?” rotation. Their likely best pitcher is either injured and therefore an unknown (Nelson), a low-velocity sinker/change command master (Davies), or on the wrong side of 30 with one good career year (Anderson). Their major free agent signing is best described as a potential darkhorse improvement candidate (Chacin), and their other free agent is on a change-of-scenery, win-a-job-in-camp contract (Gallardo). Behind this group, there’s either the one-off age-31 star from 2016 (Guerra), the Raptor swingman working from the south side (Suter), and the Top 10 prospect who grades as a middle-rotation guy (Woodruff). Ironically, the warts on this group resemble the 2017 #TeamDepth that nearly lead the team to the playoffs, where everyone could find so many words to describe the team’s shortcomings without finding enough words to figure out how it would all work. I’ll be damned if this doesn’t look like another market inefficiency (pick up guys with profiles other teams might punt on and throw some strikes! ); I’ve learned my lessons as an analyst, and with these beautiful shortcomings in mind the best story of Spring Training could be the Brewers entering with the rotation as it stands.